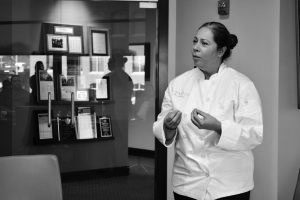 It’s time to welcome the next chef into the Revolving Test Kitchen (RTK) after two successful businesses got their start in Northern Essex Community College’s downtown location at 420 Common St. In its third year, the Revolving Test Kitchen is a private/public collaboration between Lupoli Companies, the City of Lawrence, The Lawrence Partnership and Northern Essex Community College. It provides food entrepreneurs with the opportunity to fulfill their dreams of restaurant ownership by giving them access to the resources they may not have otherwise had access to. “RTK allows entrepreneurs a chance to learn and grow without the financial burden associated with beginning a business,” says Sal Lupoli, president and CEO of Lupoli Companies. First place winner and next resident of the RTK, Angie Jimenez, owner of Bocaditos, presenting in the 2nd and final round of interviews. “Plus, it provides us with the chance to give back to the City of Lawrence by job creation and economic stimulus at the local level.” The first local business to operate out of RTK was the borinquen taqueria, Coco Ray’s. “This was a life changing opportunity and I am grateful to Sal Lupoli and the Lawrence community for the support they have given me,” says Owner Raymond Gonzalez, who is now located at 197 Parker Street in Lawrence. And the next restaurant start-up to benefit from the program was El Encanto BBQ with owner, Danny Torres, who says, “This is a great chance to grow as an entrepreneur and really be successful.” And thanks to this program, Torres is in the process of looking for a permanent location in Lawrence. Many applicants were vying for the top spot in this special kitchen and each entrepreneur presented to a prestige panel including Sal Lupoli, president and CEO of Lupoli Companies, Lane Glenn, president of Northern Essex Community College, Derek Mitchell, Lawrence Partnership, and Janin Duran, executive director of EParaTodos/EforAll. “We had more applicants this year than ever before and the quality of these chefs and their experience was simply outstanding, it made our decision very difficult,” says Dr. Lane Glenn, President of Northern Essex Community College. “It really illustrates the need for this unique program as well as the sustainability of it.” The first-place honor went to Angie Jimenez, owner of Bocaditos who wants to bring delicious and healthy, homemade food to Lawrence. Offering Latin-inspired dishes, appetizers and desserts from scratch using the freshest ingredients from the soil, served for the fast food environment. This longtime resident is ready to bring her restaurant to the next level using locally sourced food to connect with the community. She will be opening in the Revolving Test Kitchen in early March. This year, two additional honors were also awarded to the competing entrepreneurs. Kiosko del Tiguerito, owned by Maria Osorio, earned a seat in EparaTodos’ Spanish-language accelerator, Negocios Exitosos and will also receive resources to help solidify her business plan. Plus, she will have the chance to move past the first-round of interviews when applying for the next RTK search. And restaurant Compass by Antoine was also given an opportunity to benefit from application assistance to the summer session of Negocios Exitosos.